This page is a chance to show some of the people we have been able to help since we started the project and the difference having a new or replacement bike has made to them. 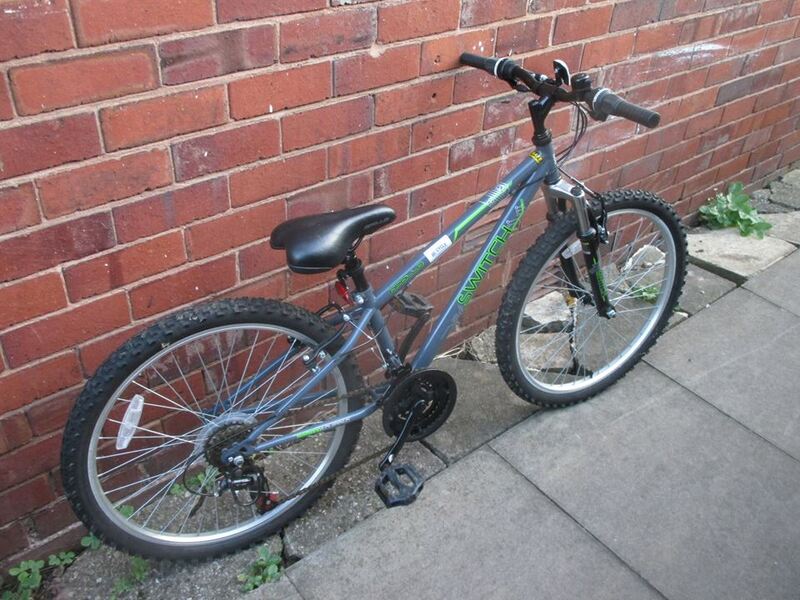 All our bikes are given as free, long term loans for as long as they are needed. 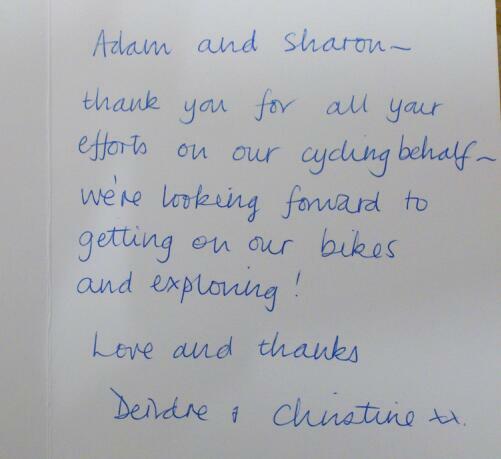 We also work with people to help them to maintain their bikes. 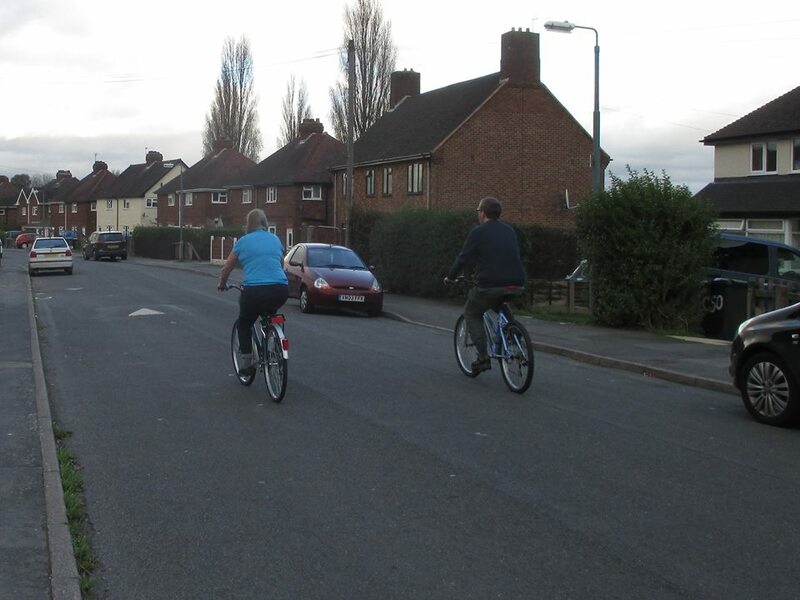 We organise rides and social events to equip people with the skills to use their bikes. 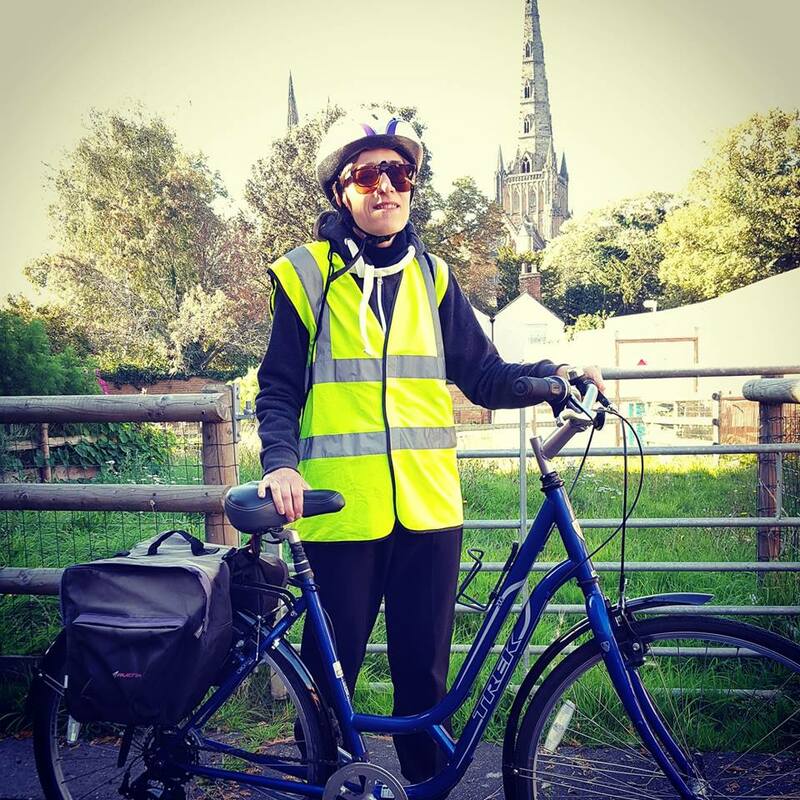 We take referrals from a range of organisations and specialise in building the confidence and resilience of people who want to use cycling as part of their wellbeing and everyday life. We were able to replace a bike when Nary had hers stolen. She uses it every day. 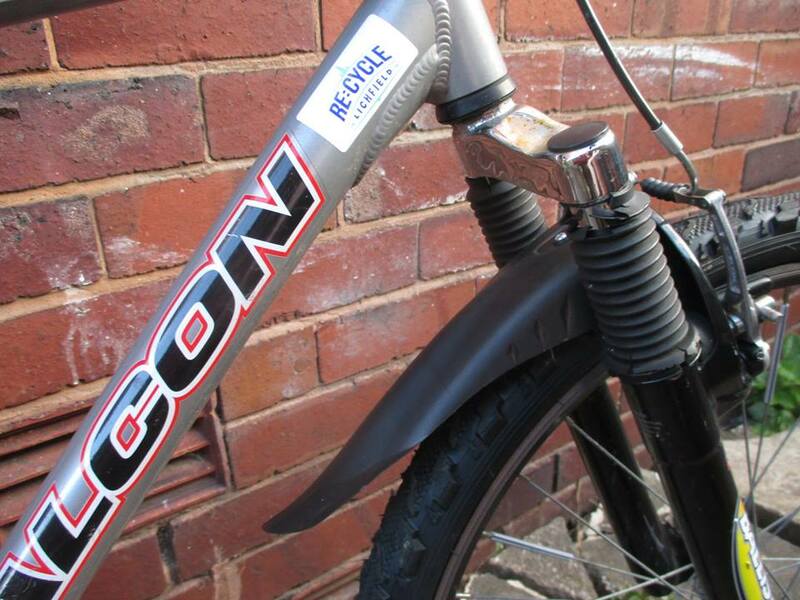 Patryk had this bike to cycle to work on. 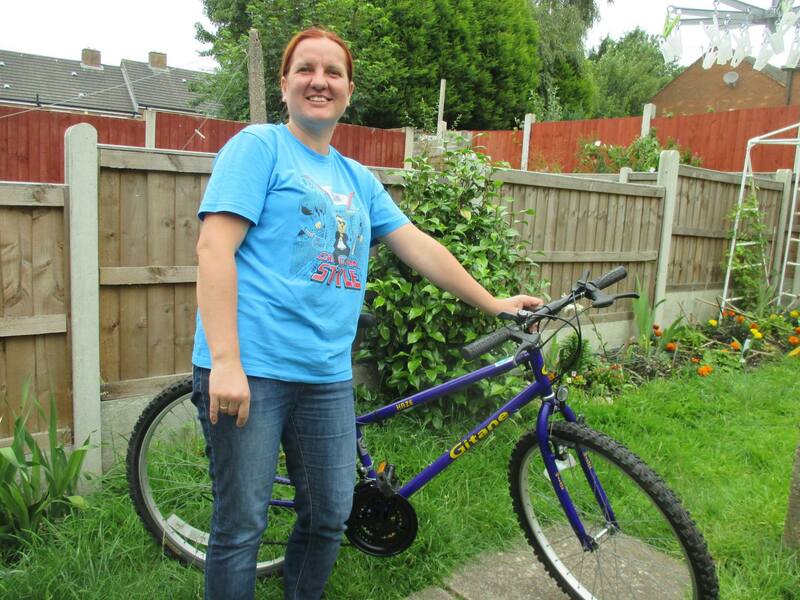 Shelley used her bike to cycle to work. Bill out on one of our rides. 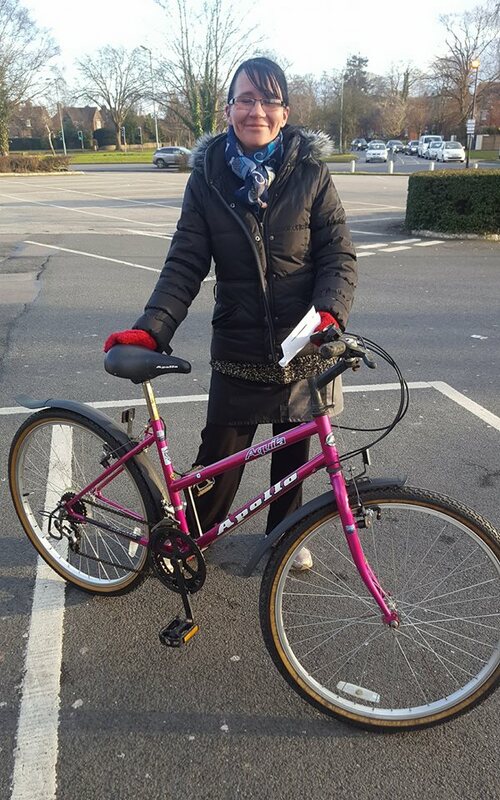 Lesley had a free long term loan bike and lessons to give her confidence to ride it. 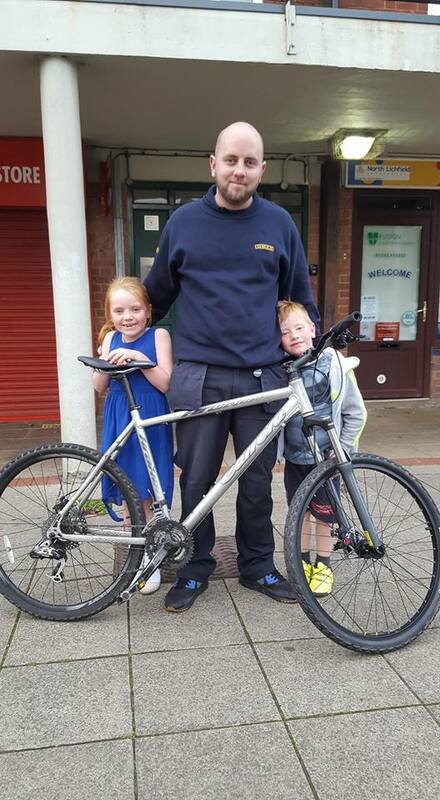 Happy to be able to help Adam with one of our free loan bikes to help him to cycle to work and with his kids after his bike was stolen. We helped Owen replace his stolen bikes with the help of our friends at the Vintage Bike Cartel. 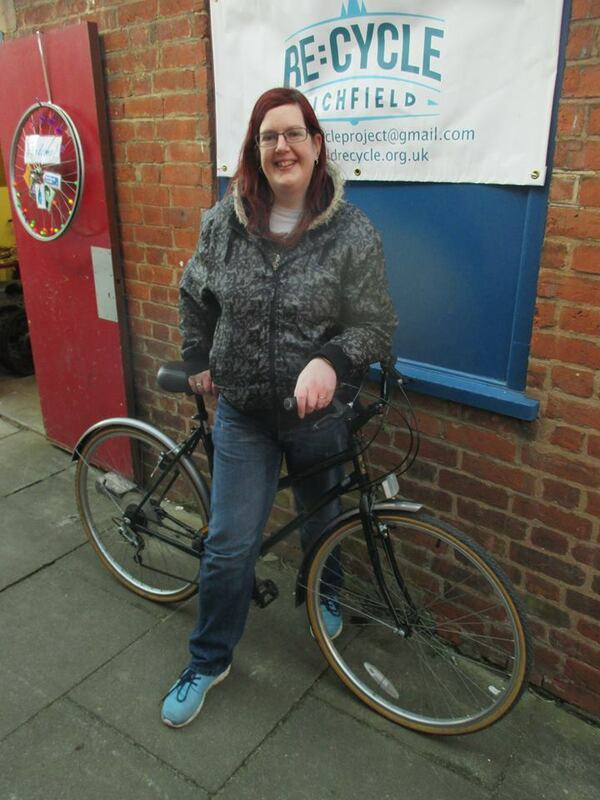 We loaned this bike to Kirsten to help her cycle to work instead of walking. Janine’s doctor advised gentle exercise for a heart condition. 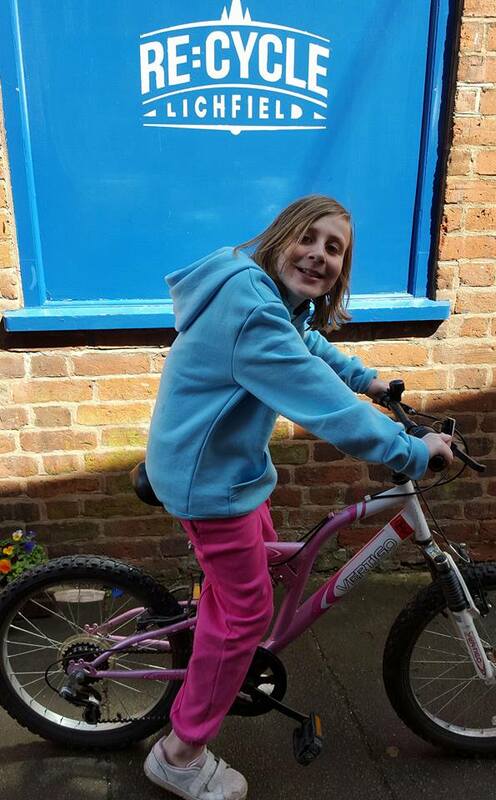 It has been a few years since she last rode but she wants to try cycling and we were happy to be able to provide a bike and any ongoing support needed. 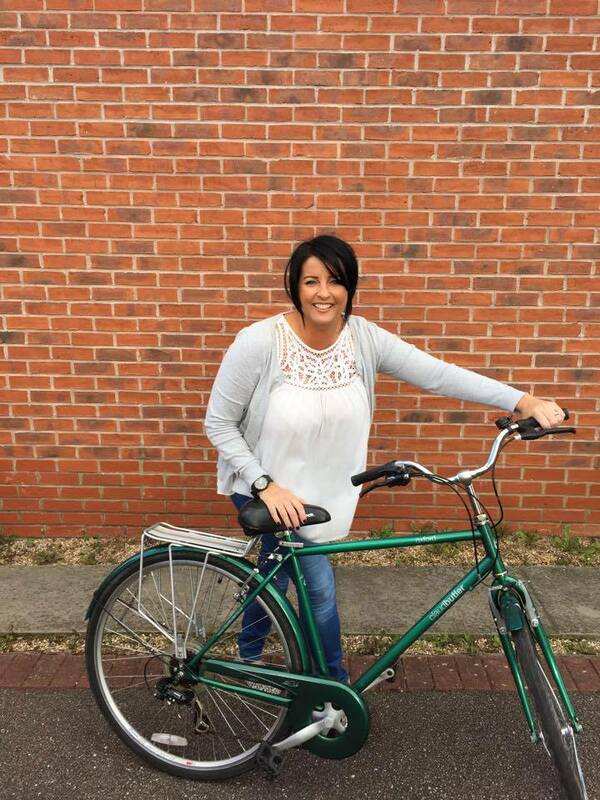 Amy needed a bigger bike so we were very happy to be able to loan her this one. 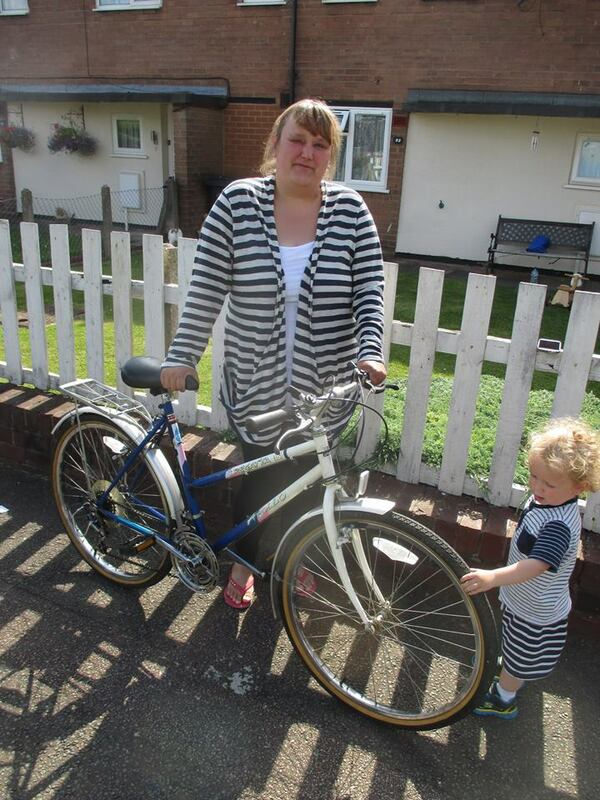 Catherine had this loan hybrid bike in return for her too small mountain bike to be able to cycle with her family. Manuel came with a bike with lots of things that needed to be fixed. The easiest thing was to loan him this bike instead! 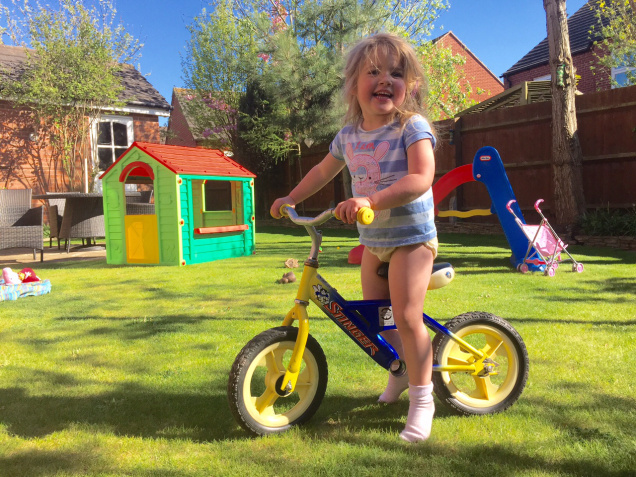 Children growing quickly can mean that they grow out of bikes in a blink of an eye. 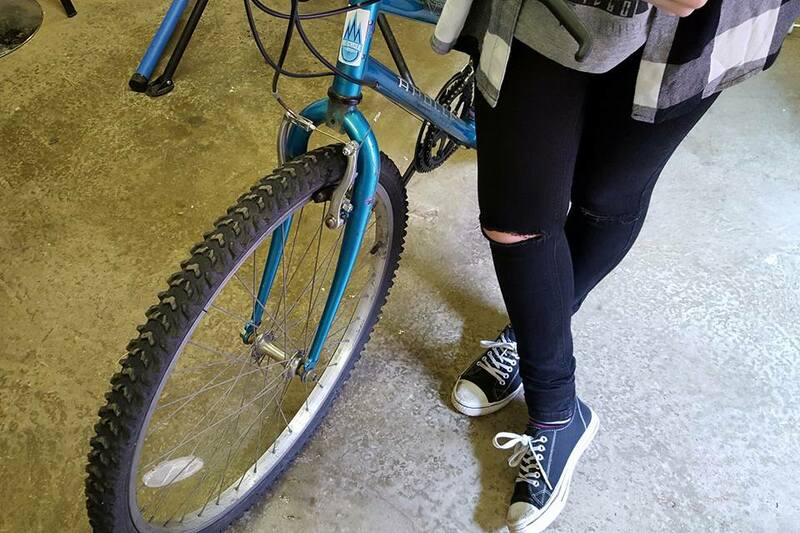 This girl had outgrown her 20 inch wheel bike so they donated it to us and we loaned them this 24 inch wheel bike. If she keeps growing she will probably require a small frame 26 inch wheel bike before too long. If she brings this one back we can loan her the next size. 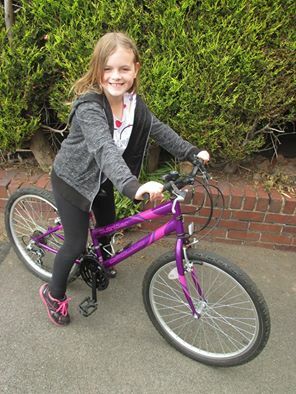 She will use this bike to cycle with her parnts and brother and sister. 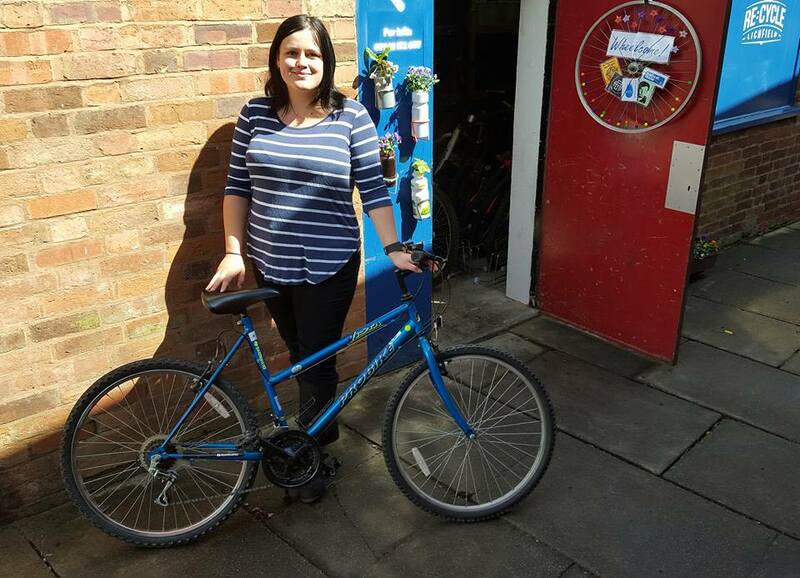 We were able to help Hannah who had her bike stolen from her garden loaning her this bike for free for as long as she needs it. 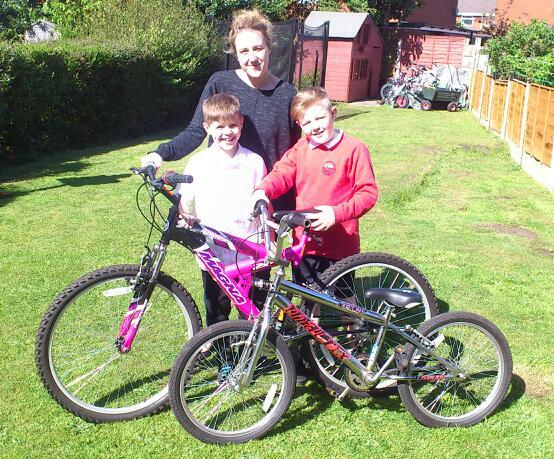 She uses her bike to cycle with her family and enjoys the health benefits cycling provides. 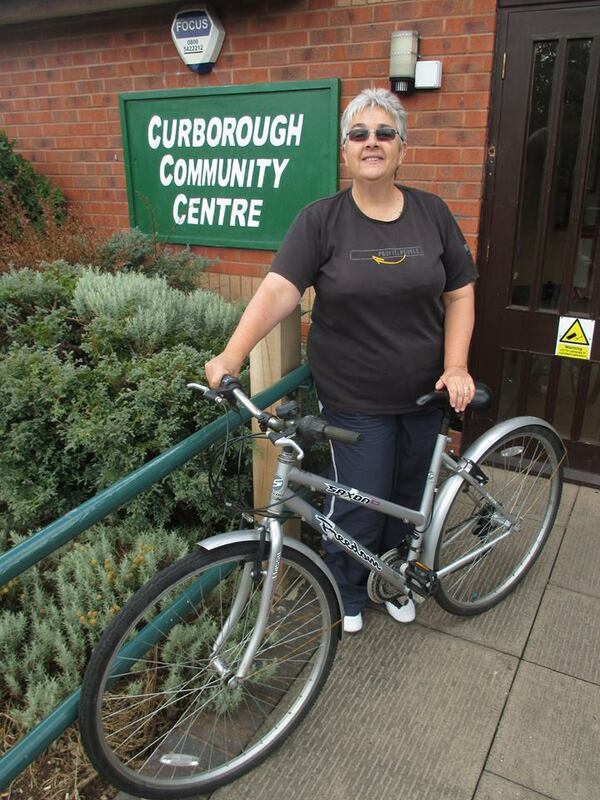 She is also a volunteer with the local Cycle Rides For All. 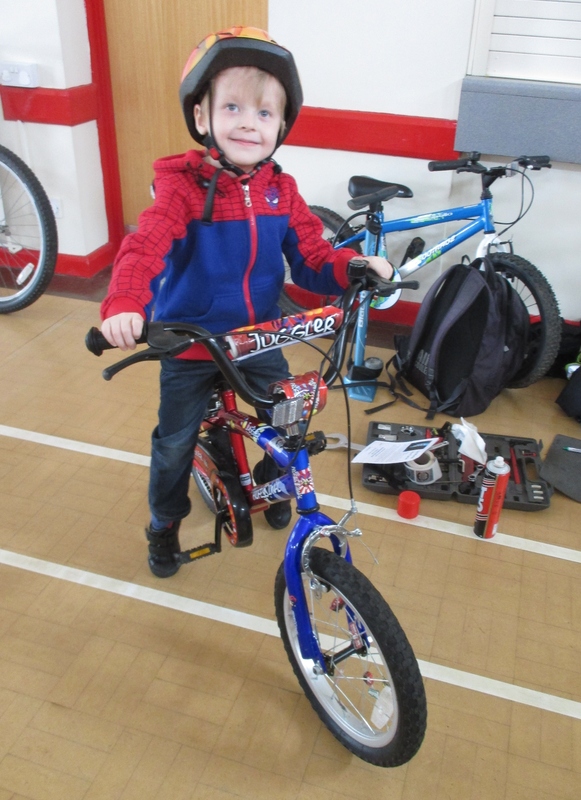 We are working with Josh to equip him with the skills to safely ride a bike. He has some difficulty with his balance so we made this adult size balance bike to build his confidence before we move towards a bike with pedals on. 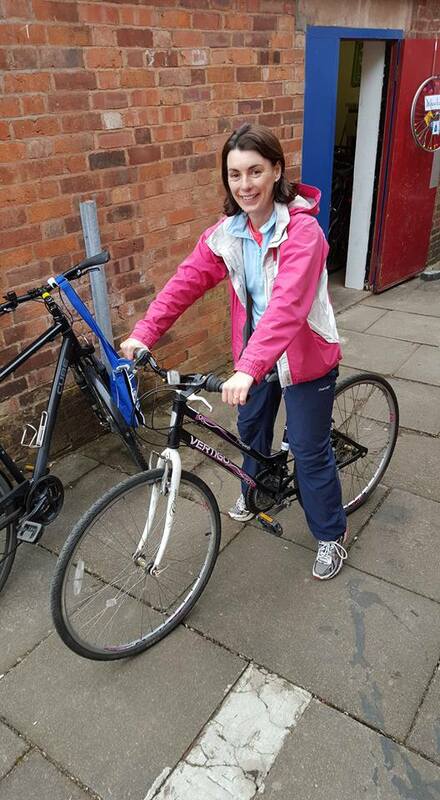 We loaned this bike to a North Lichfield woman to get to work. Her car needs expensive repairs and is off the road and she didn’t feel very safe walking in the dark through town. Also cycling will be quicker! We were also able to give a set of lights and some route planning advice. 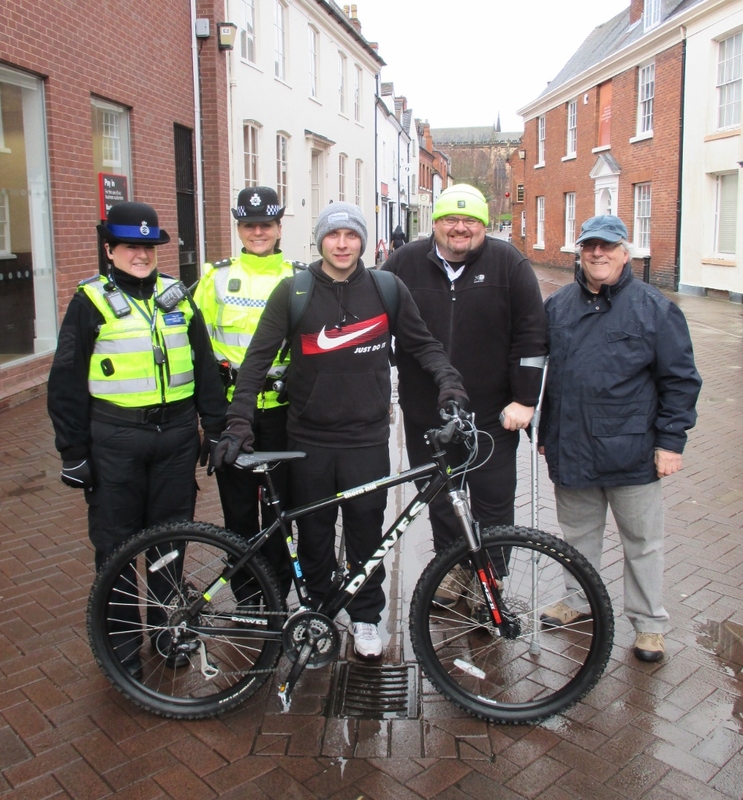 This bike went on loan to a young man who is looking for work in the Lichfield or Fradley area as his current job is ending. 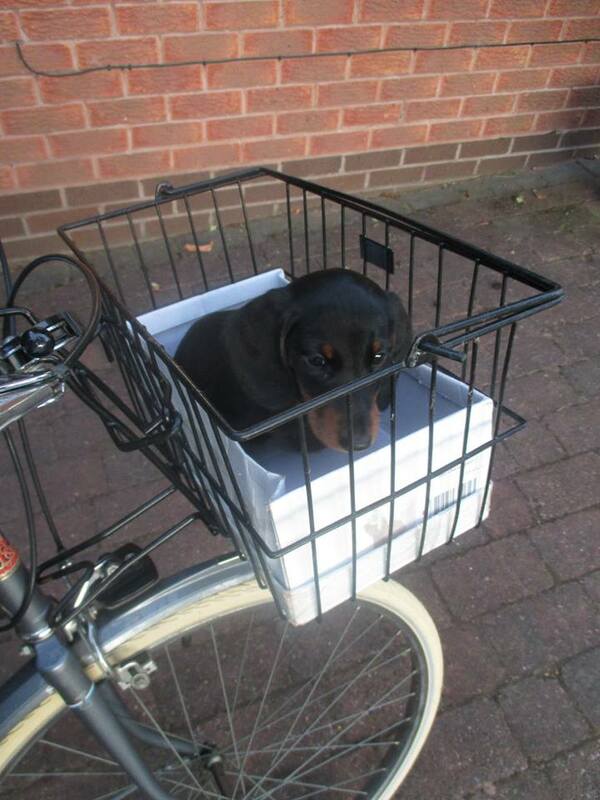 If he were to get work at Fradley and cycle this could be a way to save hundreds of pounds. 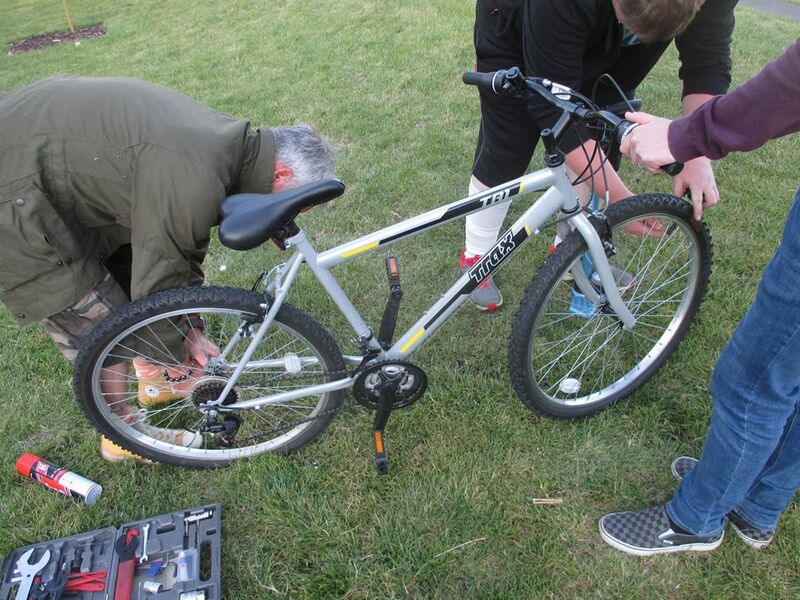 We were able to fit the bike with lights, mudguards and spoke reflectors plus ongoing support if needed. 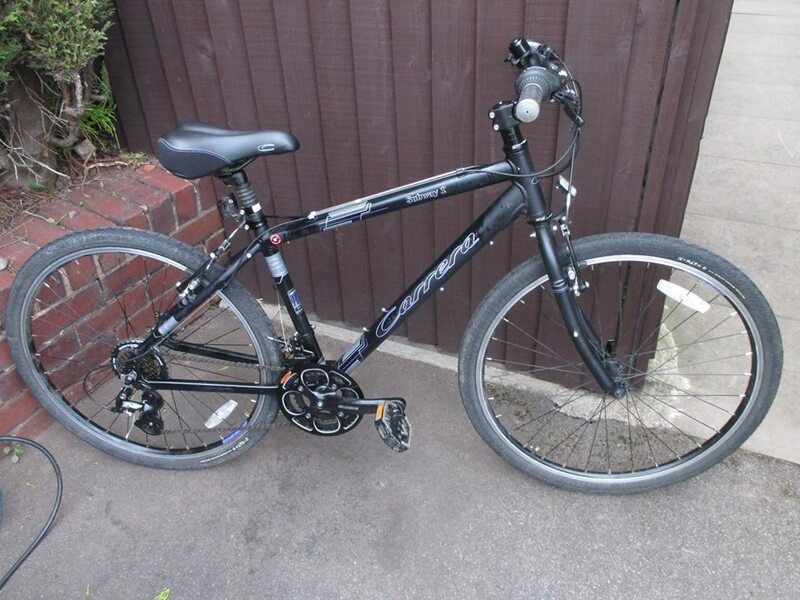 This bike went to a young man to help him get to work and out and about. Thanks to volunteer Eddie for the hard work getting it sorted for him. 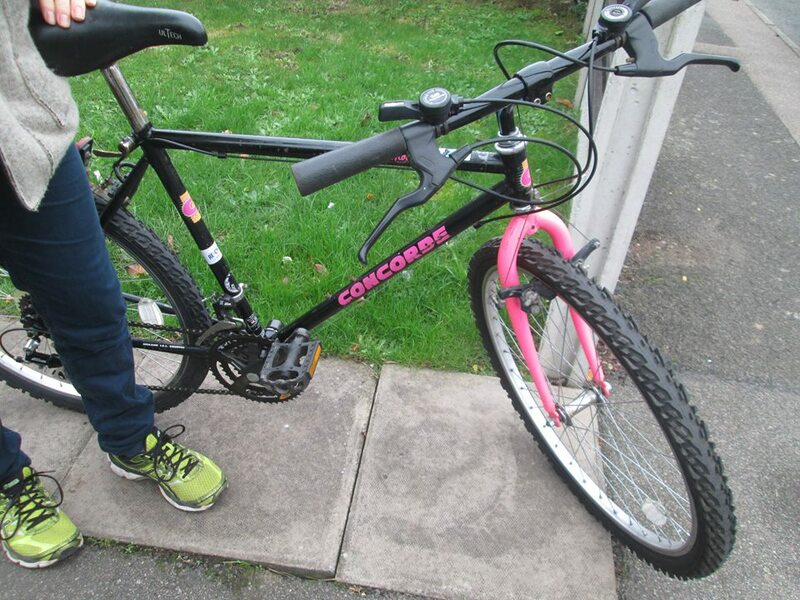 This bike went out to a person to help her cycle to work and get back home in time for her childcare responsibilities. We worked with Margaret, loaning her a bike to see if she likes riding as she hasn’t really done it since she was a kid. As well as the bike we will be offering to help her learn maintenance skills, route planning and confidence building as much as is needed. 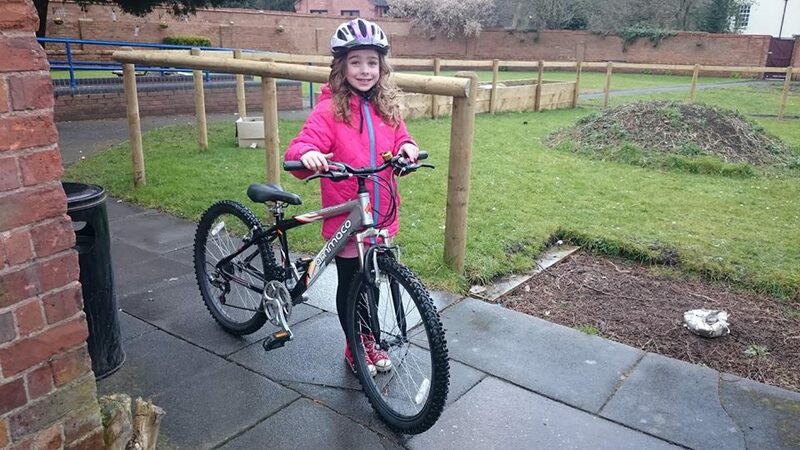 This bike went to a girl who had her bike pinched from her back garden, so that she can take part in Bikeability when she goes back to school. 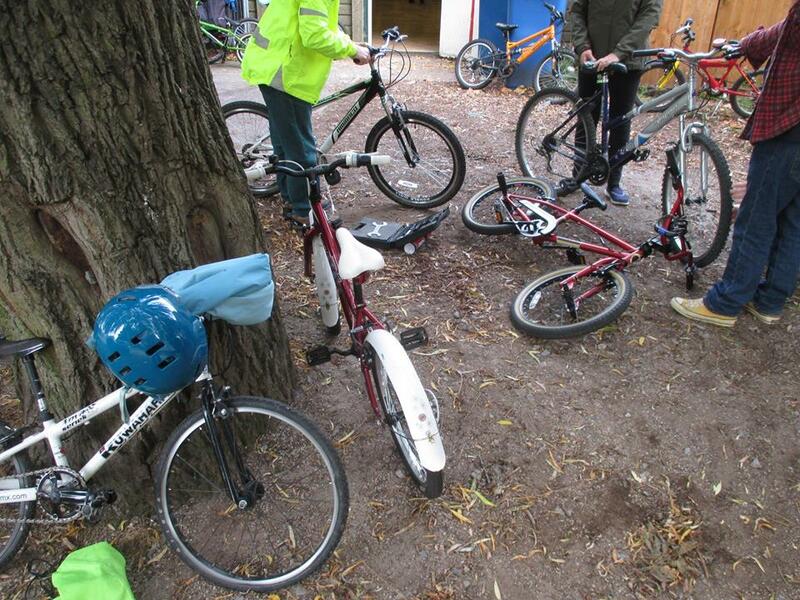 Great morning with the Saturday Cubs of 7th Lichfield helping them get their cyclist badge. 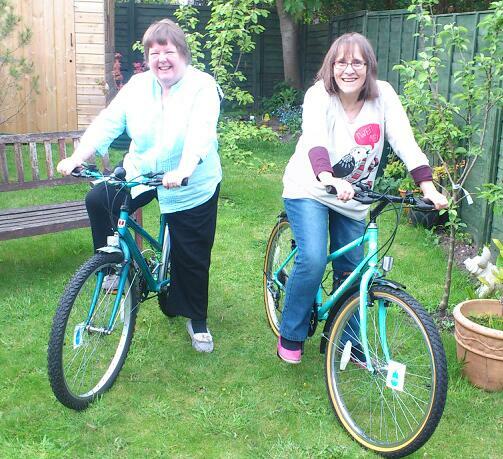 Lovely picture from Helen who had one of our bikes recently. 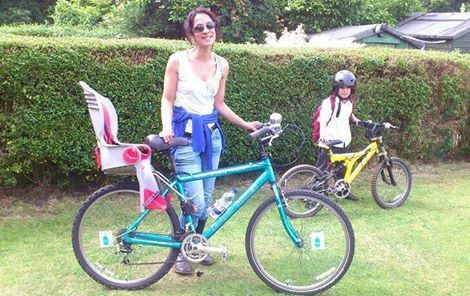 She is enjoying cycling with her kids and using the car a lot less now. Result. 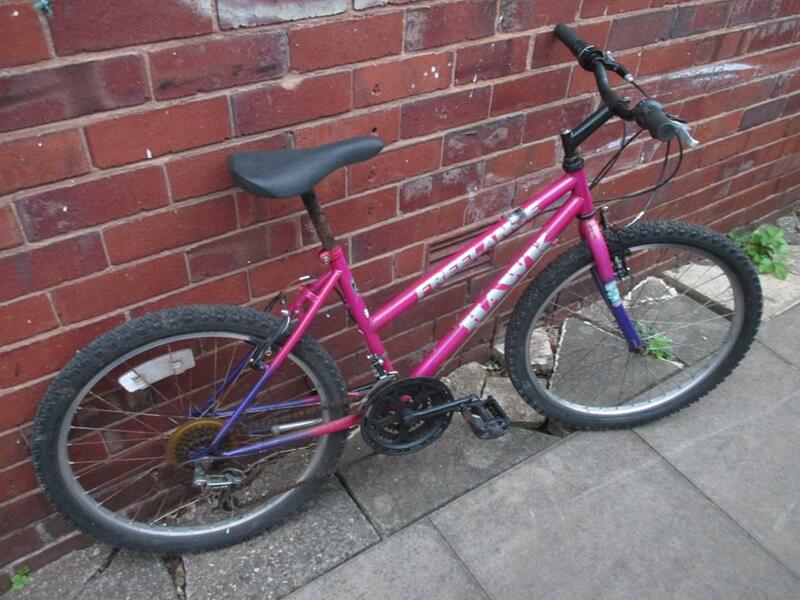 Another bike going out to a young person to access an opportunity where transport is important. Thanks to support from Severn Trent Water we are now able to offer accessories for some of the bikes we send out on free long term loan. 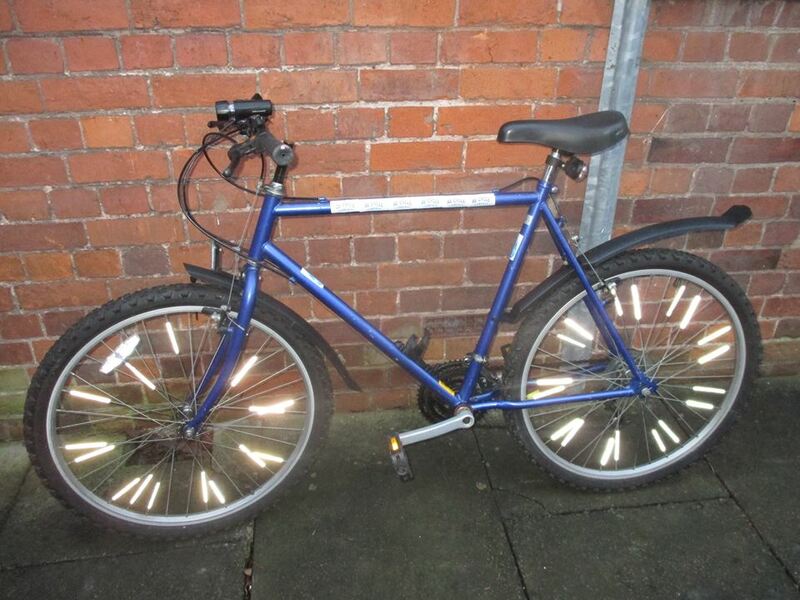 Mudguards and spoke reflectors on this one. 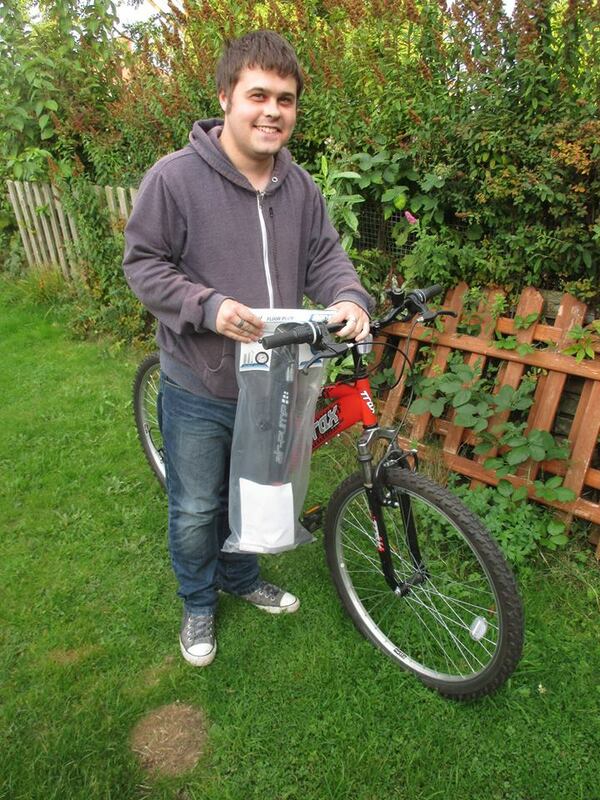 Kyle needed to get his bike fixed to ride to work in Fradley. We replaced his broken rear derailleur, fixed his bottom bracket and put a new tube in one of the tyres. We also gave him a track pump. All for free and with the promise of ongoing support should he want it. Had a call, did we have a bike for a lady who was starting work at Wall in the morning? The taxi fare was £7 each way and the buses not much less or as convenient, so she was going to walk. It just happened we did, all the best for your new job. This bike went out to a person who was taking his car off the road, needing it to get to meetings and appointments. It should come in useful. 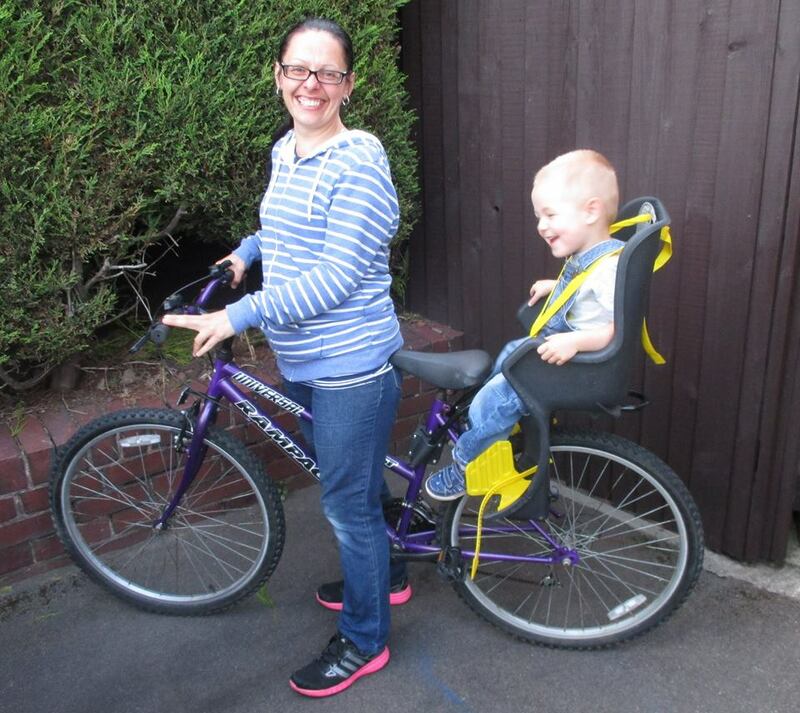 Tammy and Scott had this bike today with child seat to take the youngster to nursery and back and hopefully a lot further too. This bike went out to Sam tonight. 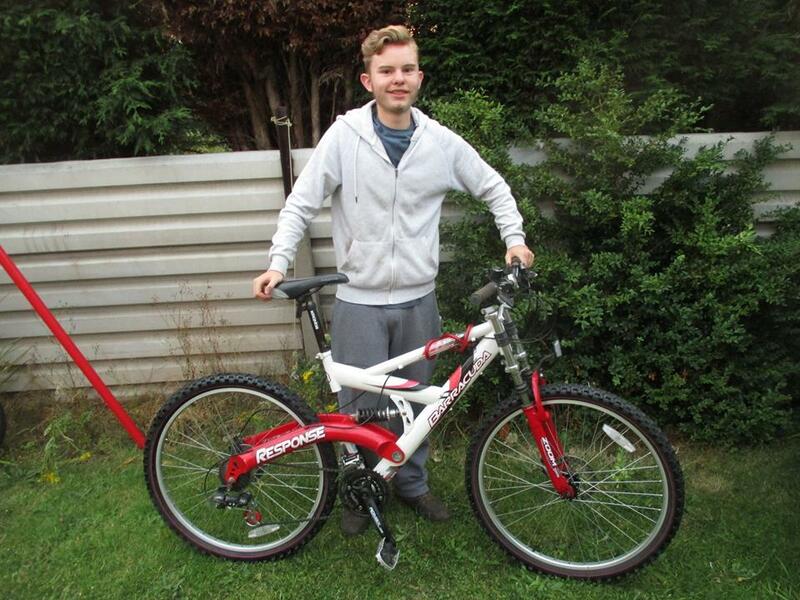 a replacement for a bike he had as a Christmas present that was stolen from outside Morrisons in Lichfield. 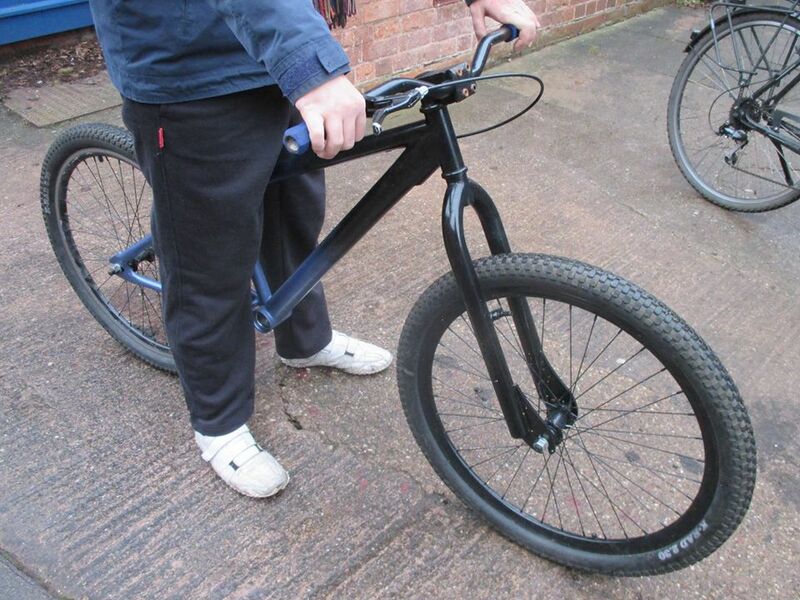 This bike came from the lost, found & stolen bikes that were unclaimed and donated to us by Lichfield Police. A nice happy ending! 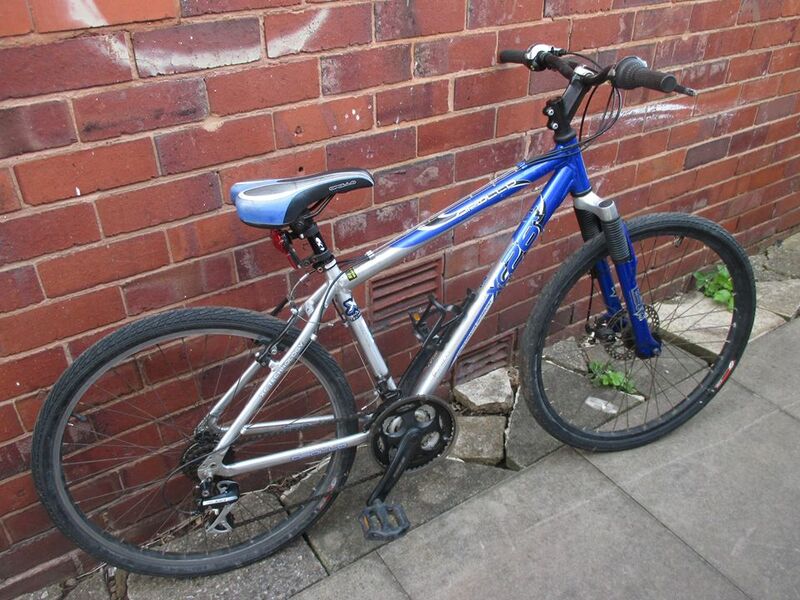 Sam had this bike on free long term loan to cycle to work in Shenstone. Carol and Gordon have recently moved to Lichfield from Scotland. Both being around the 6ft mark it has been difficult, but we have found them a pair of bikes to ride together to meet new people and discover new places. Here is Pedro in the basket we are loaning for the next three weeks, until he has finished his course of vaccinations, to get out and about. We made this balance bike for Nathanial. 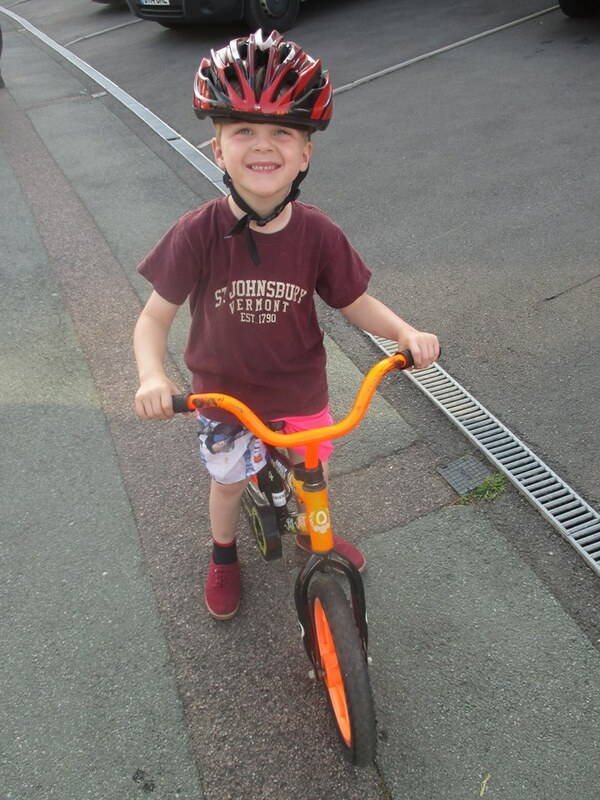 He has struggled to learn to balance and ride a bike with pedals but had tried a balance bike at school and that suited him better. Just in time for his birthday. Clair had this bike today to go out cycling with her son. We rounded off a busy day with a trip to the skate park, chatting to the people there and helping out. Heather and the bike going to her this week. 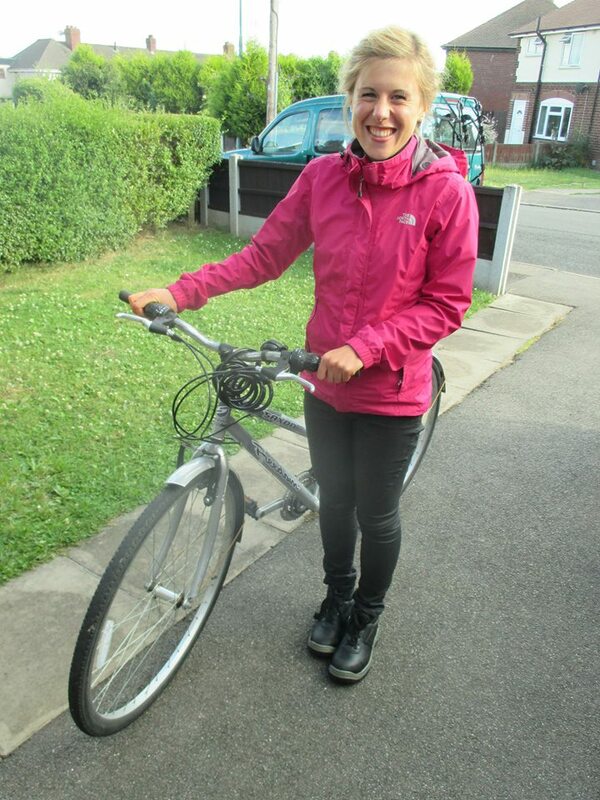 Manon from France had started a month long internship with Faurecia at Fradley and was walking there each day from Lichfield. She was happy to receive the bike and a lock for the duration of her stay here. 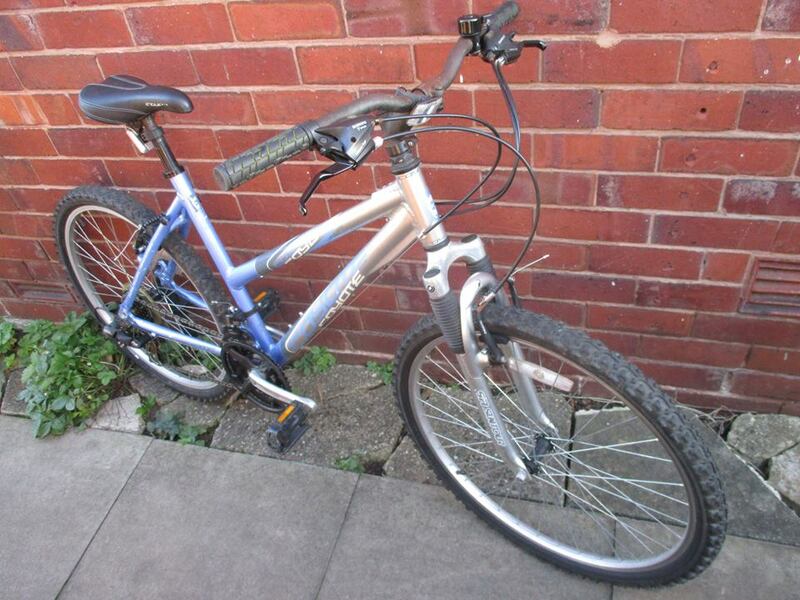 Ania will be using this bike to go to the allotment and the gym. 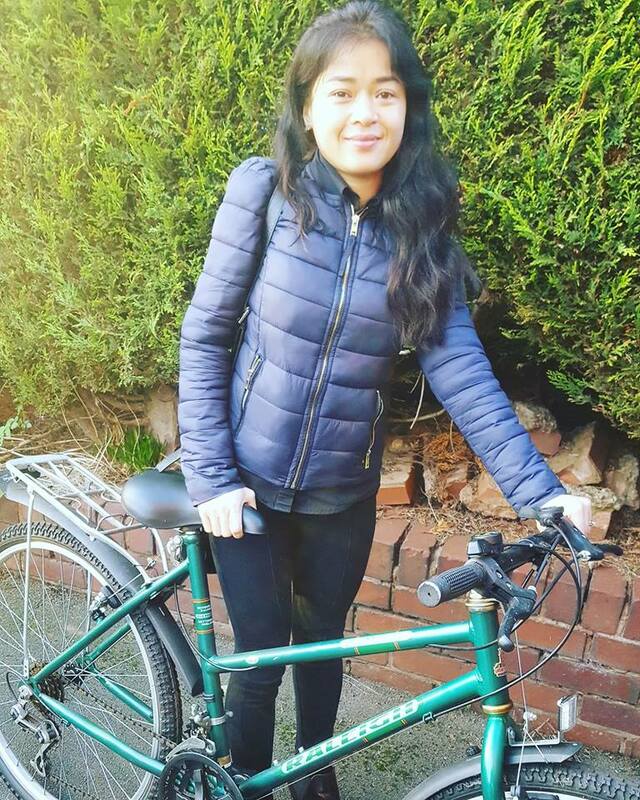 From volunteer Adam: “I found a home for another bicycle yesterday, for Naheed who was riding a really tatty mountain bike, the brakes were non existent, cables rusted, calipers seized and out of 21 gears she had about three. The tyres were down to the canvas, with a big split in the sidewall and the front wheel was wobbling and had a spoke missing, not the best thing to transport your kid safely to nursery in a rear child carrier with! It is great to give out bikes in groups to one family. This leads to them being used more as they will ride together. This was a donation of 5 bikes in total for a family of siblings and cousins. 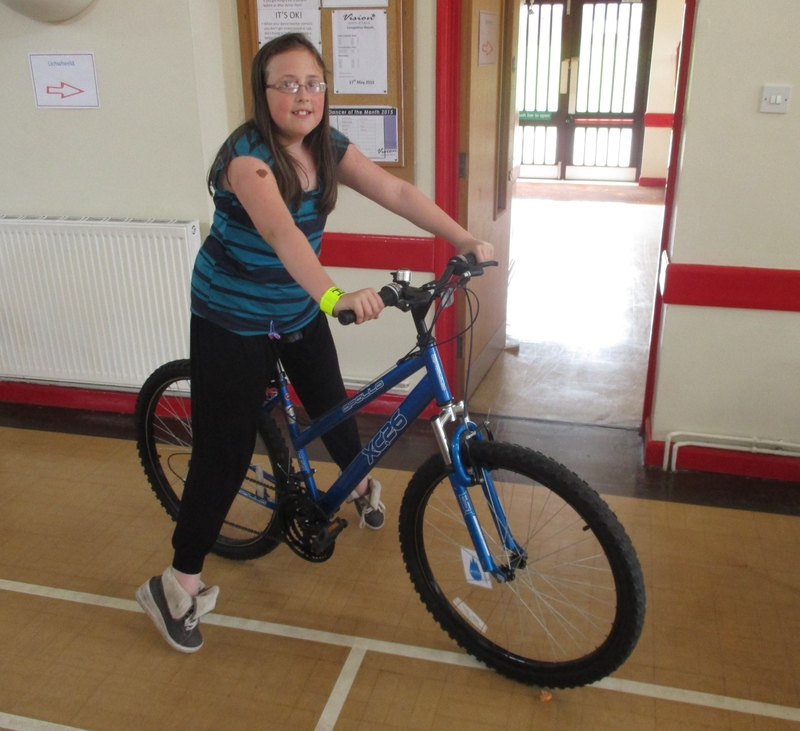 Izzy is just one example of the bikes we have been able to loan to young people when they have outgrown their old one. Often at this age they can get through the next size up bike in little more than a year before they require a bigger one. Our project is very happy to loan a bike and then give out another in exchange when it is needed. 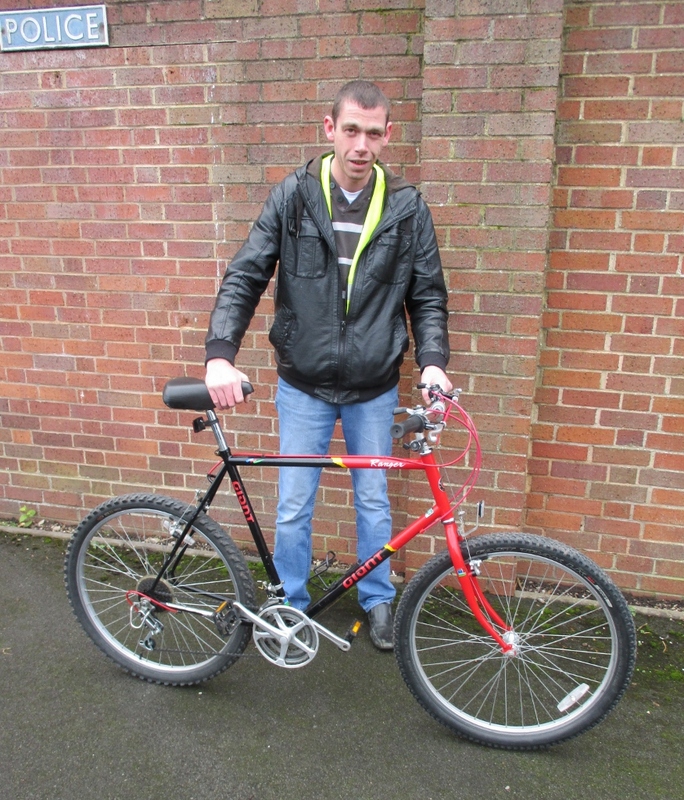 “Lichfield Re:Cycle has supported one of our Talent Match beneficiaries in getting a bike and training him to look after his bike. 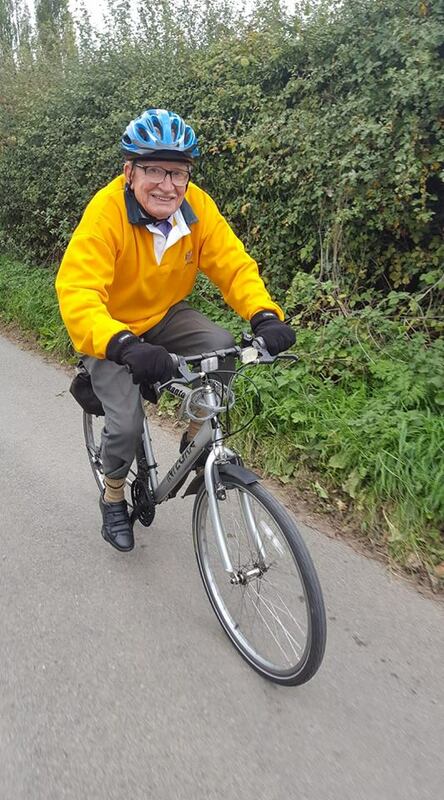 Furthermore, Lichfield Re:Cycle helped him plan routes and supported him for the first couple of times he has had to use the bike to help him increase his confidence in doing the routes himself. 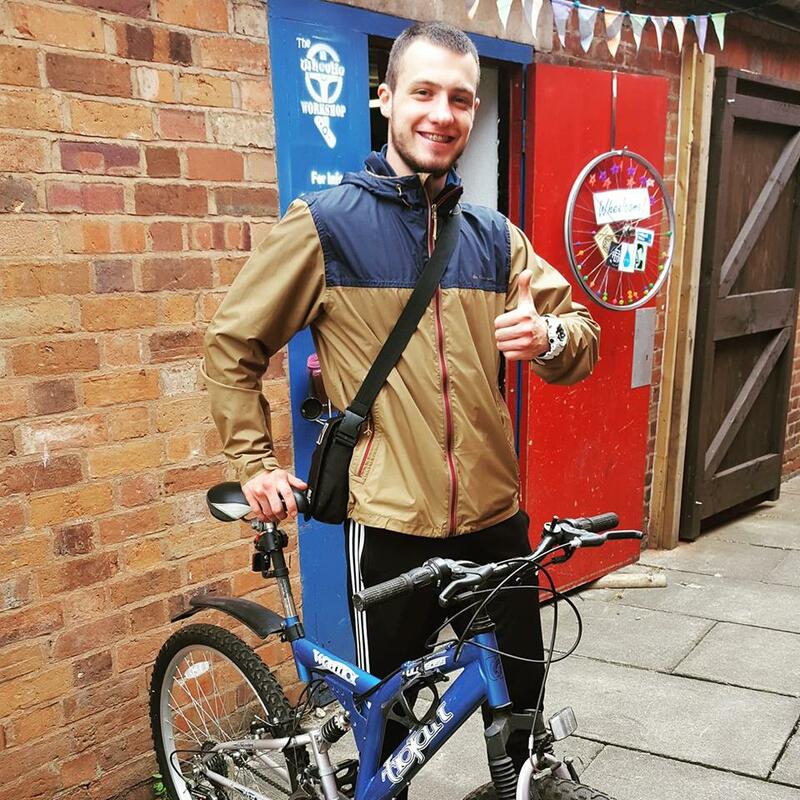 This has been a great help for our beneficiary who has used the bike to get to training courses to improve his job prospects as well as travel to and from his paid work placement. Our beneficiary is now much more confident as a result of this and enjoys his greater independence as in the past he has had to rely on public transport or relied on our support in helping him to get to training courses or other opportunities. 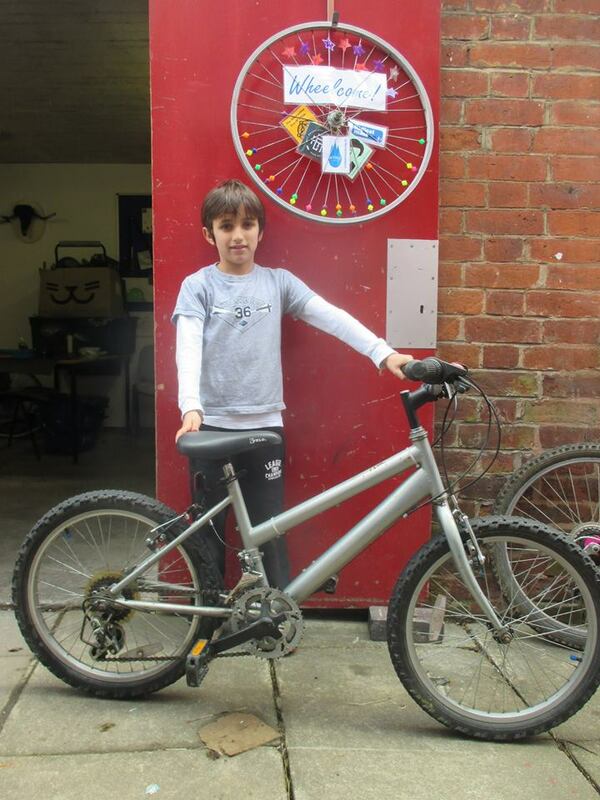 Dan had outgrown his old bike and his Mom donated it to us and took this single speed bike (without stabilisers!) on free long term loan for as long as he wants it. Jessica had outgrown her old bike so we were able to replace with this small framed ladies mountain bike. 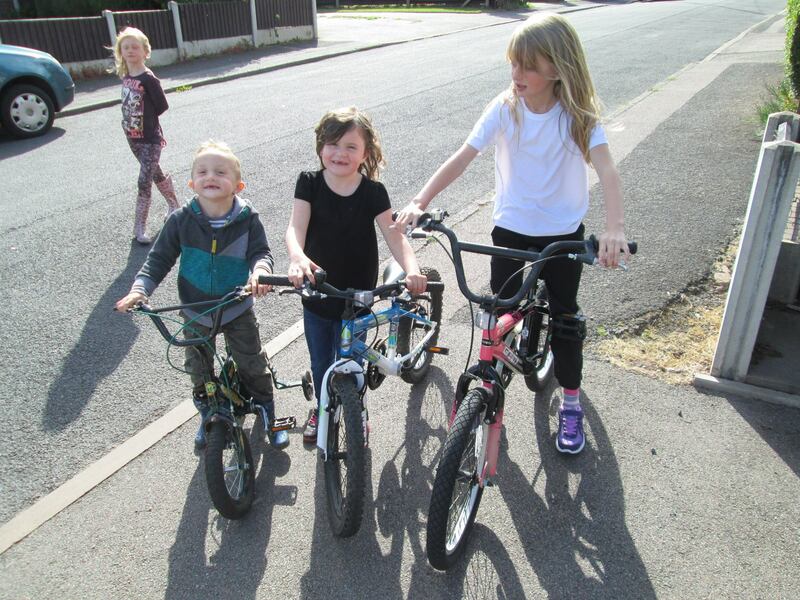 With kids outgrowing bikes faster than weeds, Katie needed a bike to keep up with them and a new one for Alfie who was chuffed with the BMX (with obligatory low down seat, he insisted). All set now for trips together round town with brother George. One of the balance bikes we have made in use. We worked with a young person in Whittington who was walking into Lichfield and literally wearing out his shoes to save the £4.20 bus fare. 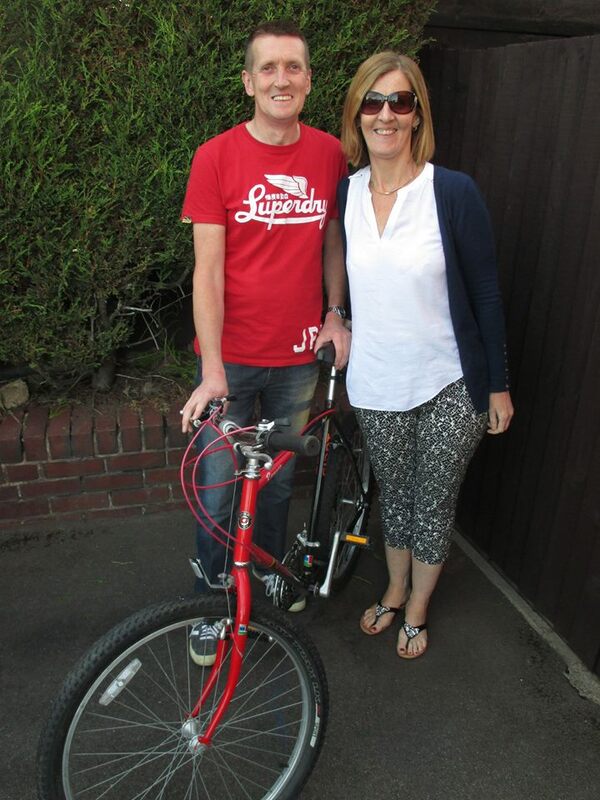 We got him sorted with a bike and one of our trustees donated a track pump. We got some lights and a lock from the local PCSO and he was sorted. 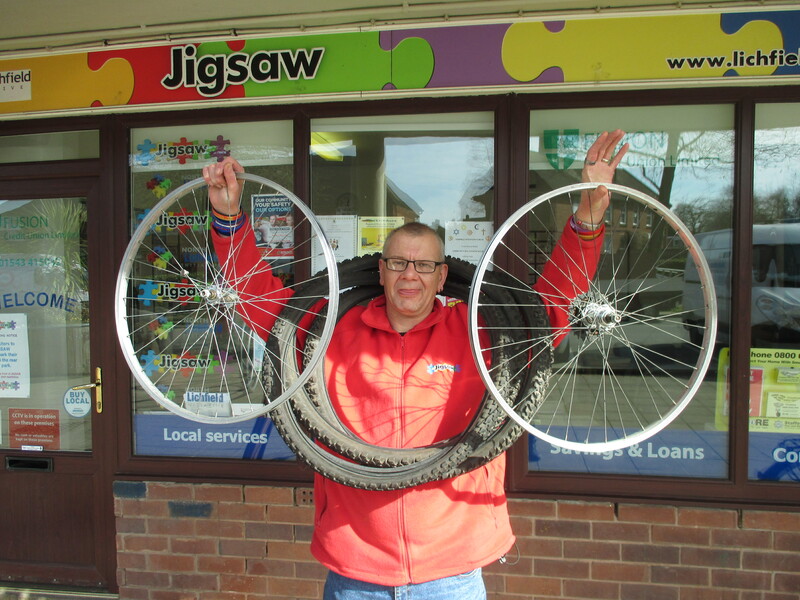 Tony, a volunteer at Jigsaw for North Lichfield Initiative contacted us to ask about parts to build up a bike. He had been given a frame and wanted a pair of wheels and some tyres. 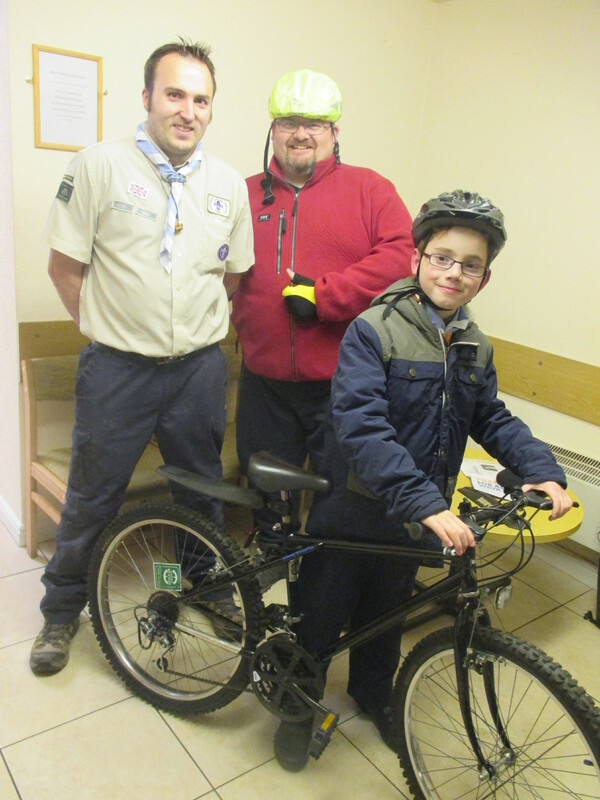 We helped the 5th Lichfield Scouts work towards their cyclist Award over four consecutive Tuesday evenings, giving demonstrations, checking over their bikes, showing them how to maintain their bike and some fun riding outside. Local musician Adam is using the mountain bike we gave him to help him look for work, for cycling with his family and for getting around to gigs he does. The last bike he had was stolen and he hasn’t been able to replace it until now. 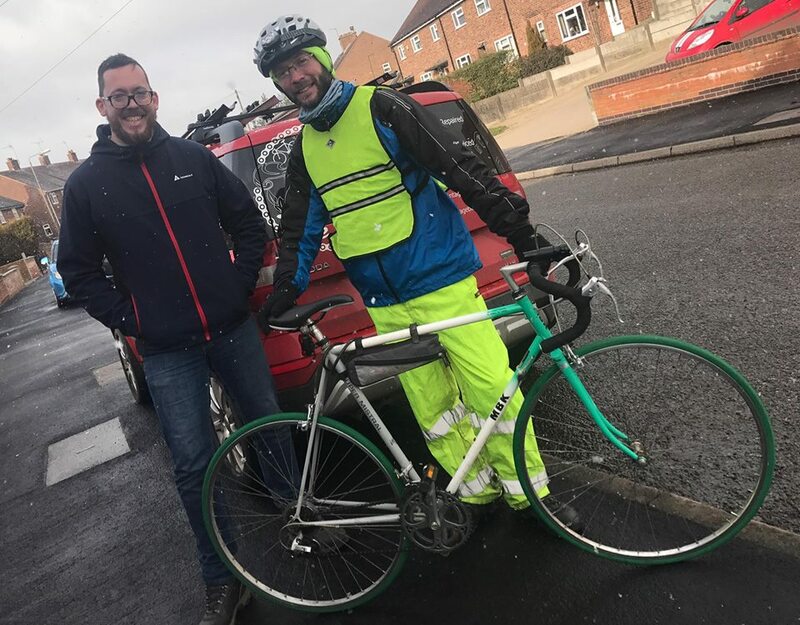 At the handover Adam said that he was “completely blown away, by what the Lichfield Re-Cycle project are doing, and what a great use for bicycles that are no longer needed……awesome”. 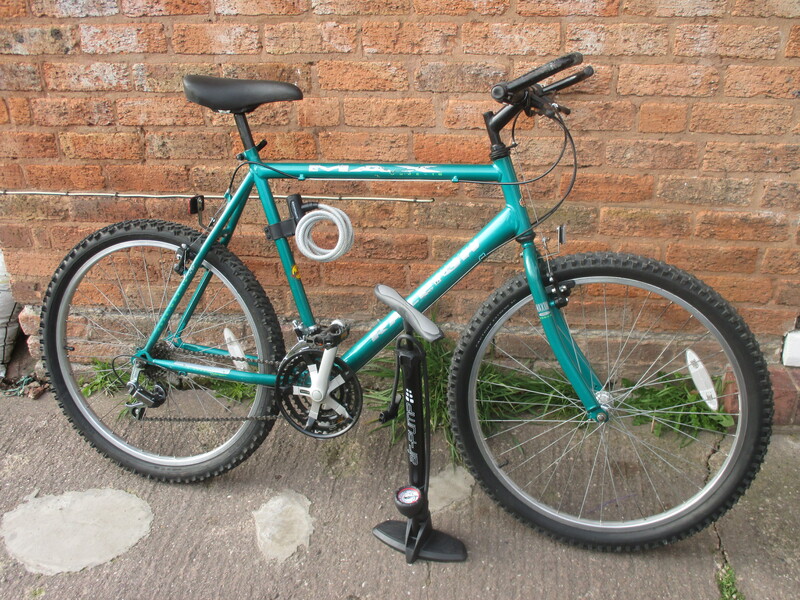 We managed to get this large frame Giant mountain bike for Chris to cycle to work on and to cycle with his young son. Chris scrapped his car as he couldn’t afford to run it and the cost of public transport to work at Fradley would eat up a large part of his part time wages. 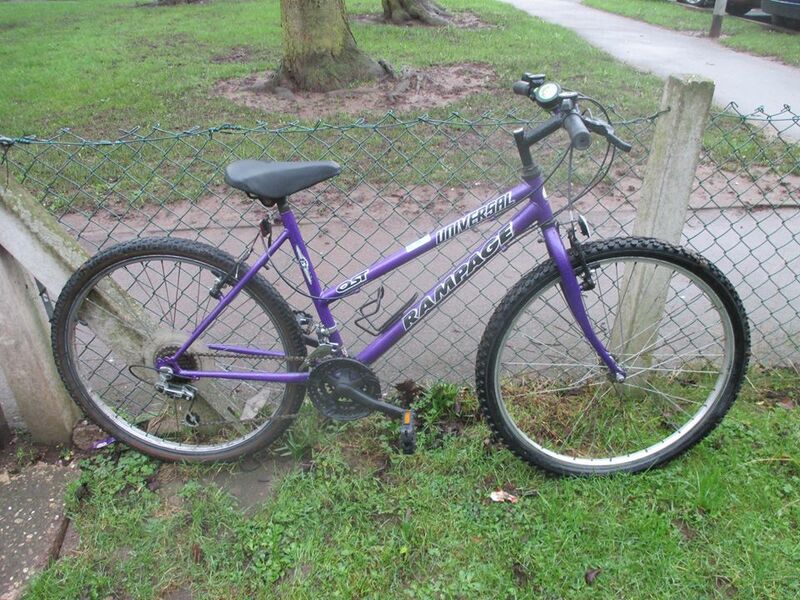 Terry received this Dawes mountain bike having had his stolen from outside the HSBC bank in Lichfield. 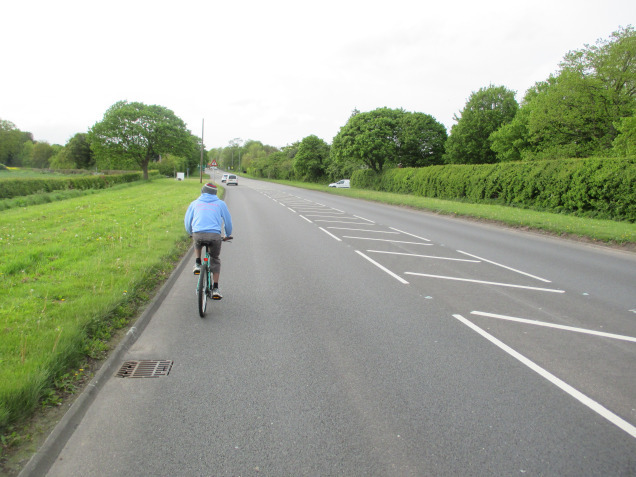 He uses it to cycle to work in Fradley instead of walking there. 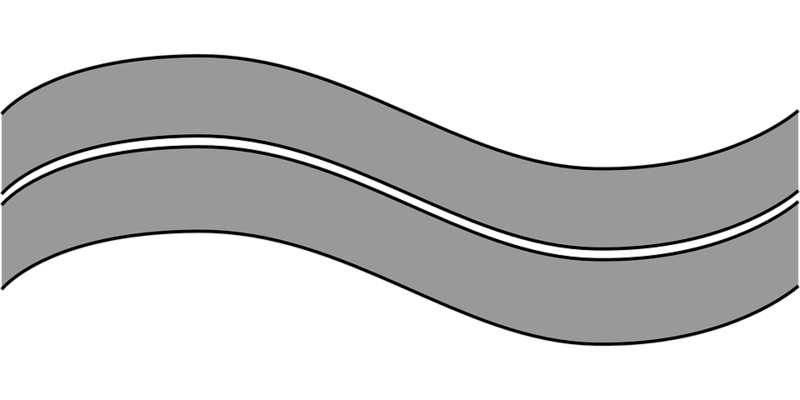 You can read about the development of the project on the Lichwheeld blog here.